The Irish author Kate O'Brien wrote this political and passion-filled intrigue in 1946. It centers around the life of the Princess of Eboli, Ana de Mendoza who was an aristocrat and member of one of Spain's leading families of the era. 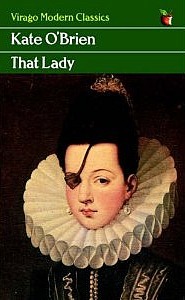 Married at thirteen to one of the king's closest counsellors, she was regarded as one of Spain's most beautiful women, even though she lost one of her eyes in duel with a page when she was young. The book begins after her husband's death when unwisely she begins an affair with the dandy adulterer and skilled politician Don Antonio Perez. Her relationship becomes politically entangled after the murder of a prominent politician, and her lover is implicated in the crime. Additionally King Philip II begrudges the love affair as he had his eye on Ana himself it seems! and the two lovers are eventually imprisoned at the king's pleasure, without charge or conviction. The particular interest in this novel for this reader are the historical characters and places into which the history of the guitar and vihuela are also woven. For instance Ana de Mendoza's lands of inheritance include the province of Guadalajara, which is the birthplace of the Renaissance composer Alonso Mudarra (c. 1510 – April 1, 1580) Mudarra was apparently in the employ of the fourth Duke of the Infantado, Íñigo López de Mendoza - another member of the powerful Mendoza family. Luis de Narvaez (ca. 1500-1555) is another vihuelist with links to this era. He was employed as a musician in the royal chapel of Felipe, regent of Spain who later became King Philip II, the character in this book. This book is a wonderful read and aims at the utmost historical correctness possible without letting that dry up it's author's imagination. The author's evident knowledge and love of Spain thoroughly enhances a story filled with colourful and credible characters. I recommend this book for everyone who enjoys a good story set in a historical setting.